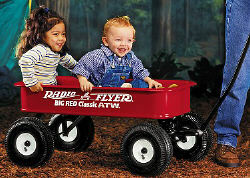 Radio Flyer's classic red wagon just got 50% deeper! The Model #1800 has high sides for extra capacity, as well real air tires for a super soft, super quiet ride. Wagon Body: 36" x 17 1/2" x 6"